So wrote a 25-year-old Australian private who was prepared to risk paying his own fare home to Australia for the sake of getting treatment at Queen Square. His notes record that he was discharged ‘cured’. He was one of 65 men who either had problems with stuttering and stammering or were completely unable to talk or even whisper – although they might cry out in their dreams. This was one of the hospitals featured in Pat Barker’s ‘Regeneration’, where the humane physician Dr WHR Rivers from Craiglockhart War Hospital for Officers is shocked by the brutal treatments meted out by the controlling and punitive Dr Yealland. The reality was rather different according to these authors: all treatments apart from psychoanalysis that were available at the time were used at Queen Square and Lewis Yealland was a junior doctor who used painful electrical currents only when other treatments failed. A small exhibition about the National Hospital and World War 1 at the Queen Square Library in 2014 said that Dr Yealland treated over 200 cases of shell-shock at the National and that although his portrayal in ‘Regeneration’ is unsympathetic, he was following War Cabinet policy to ‘cure’ soldiers so they could return to active service as quickly as possible. The case notes show, however, that of the 462 patients described (the nomenclature used changed during the war – diagnoses included neurasthenia, shell shock and hysteria), only three were recommended as fit for active military service – even though 186 were deemed cured and 212 improved. The list of symptoms is varied: many of the soldiers shook, had tremors or had peculiar gaits – walking with stiff legs on their toes for example; they might have become deaf or blind; many had paralysis of their arms or legs, together with numbness or alteration of sensation; some experienced pain, breathing problems and nausea. Psychological symptoms were also common (irritability, sensitivity to noise and sleep disturbances). One young miner-turned-private said he had “a peculiar feeling of worms growing in the lower part of the abdomen”. All so hard to imagine. All supporters of rapid methods appear to me to be optimists. Sir Arthur Hurst….is no exception. I worked in four different “shell-shock” hospitals and relapsed Seale Hayne patients were admitted to all of them, and were generally found to have no insight into their condition. Images taken from ‘War Neuroses : Netley Hospital,1917. Seale Hayne Military Hospital, 1918.’ Wellcome Trust 2008, CCBYNC. 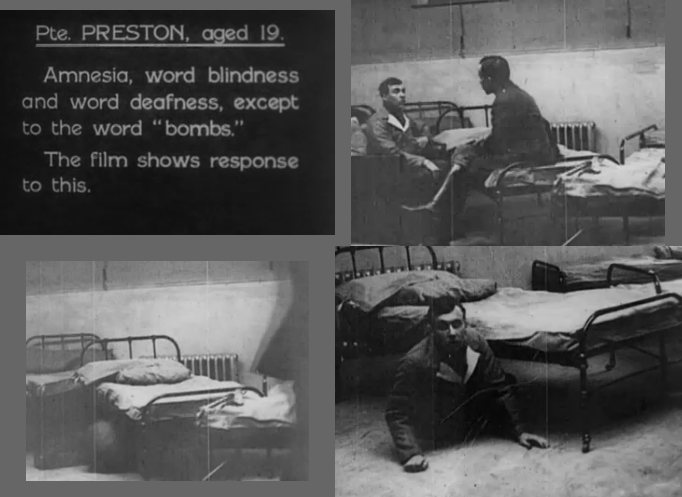 The extraordinary and touching films are available on the Wellcome Collection library website and include, in segment 1, 19-year-old Private Preston who has ‘amnesia, word blindness and word deafness, except to the word “bombs”‘. We see him sitting, apparently at ease, with another man when he suddenly dives under the bed, to emerge with the bewildered look of a child woken from a deep sleep. We don’t learn whether Private Preston recovered. Devon centre pioneered treatment for victims of shell shock. BBC website, 24 September 2014, accessed 23 February 2015. Hoare P. Palace of pain: Netley, the hospital built for an empire of soldiers. The Guardian, 21 August 2014, accessed 24 February 2015. Linden SC and Jones E. ‘Shell shock’ Revisited: An Examination of the Case Records of the National Hospital in London. Med Hist 2014;58(4):519-545. doi:10.1017/mdh.2014.51. Linden SC, Jones E, and Lees AJ. Shell shock at Queen Square: Lewis Yealland 100 years on’. Brain 2013;136(6):1976-1988. doi:10.1093/brain/aws331. Queen Square Archives exhibition autumn 2014 ‘First World War at the National’, visit and handout accessed 24 February 2015. Science Museum website entries on Lewis Ralph Yealland and William Halse Rivers, accessed 24 February 2015. ‘War Neuroses : Netley Hospital,1917. Imprint UK: Seale Hayne Military Hospital,1918.’Wellcome Collection library, accessed 23 February 2014.